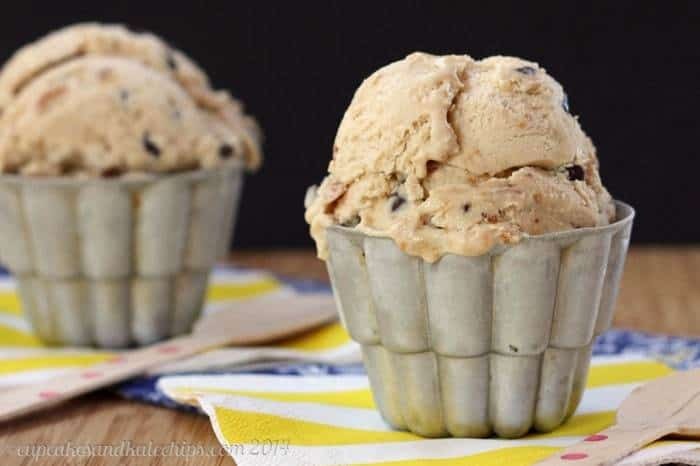 Indulge in this amazing combination of peanut butter and banana ice cream, swirled with more peanut butter and studded with mini chocolate chips. Disclosure: This post is sponsored by Davidson’s Safest Choice Eggs. All opinions are my own. 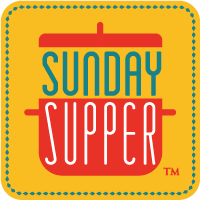 #SundaySupper and Davidson’s Safest Choice Eggs are celebrating the arrival of summertime with a menu of no-bake recipes. 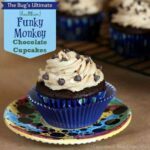 And hopefully these recipe will inspire you to create your own to enter the Safest Choice No-Bake Summer Recipe Contest for your chance to win a ticket to the Food & Wine Conference, plus a whole lot more! And when the mercury rises, I want ice cream. 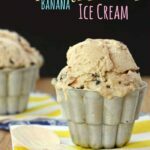 Well, I always want ice cream, especially when it is swirled with ripples of peanut butter and studded with mini chocolate chips, like this “Funky Monkey” PB Ripple Chip Banana Ice Cream. OK, confession time. I feel kind of guilty about this, but I’m going to just put it out there. I really don’t like having The Bug help me in the kitchen. I mean, I do let him sometimes, but I don’t necessarily like it. Really it’s my issue. I’m a scientist, and a perfectionist, and a food blogger who wants to make sure I get my measurements right and that it looks pretty. I’m also paranoid. And he is a grabber, toucher, taster, with no consideration for my meticulous nature, or even for his personal safety when I am using a giant chef’s knife to chop fruits and veggies, have the stand mixer or food processor running, am prepping uncooked meat to go on the grill or in the oven, or especially when I am making a sweet treat and cracking some eggs. I mean, my mom always let me lick the beaters when she was making a cake, or the bowl of cookie dough after all the cookies were in the oven, but it just makes me sooo nervous. Now who is going to invent magical knife that only cut fruit and veggies and not the aforementioned little fingers? And find a magical cure for my perfectionism? Oh well, guess I’ll be cooking solo for awhile longer. OK, so I don’t allllways make him treats like “Funky Monkey” PB Ripple Chip Banana Ice Cream, but it was a special occasion. For his birthday dinner, he requested eggs, fruit salad, and English muffins, and for dessert, instead of cake he wanted to make sundaes. Since I wasn’t making cake, I figured I’d make ice cream. 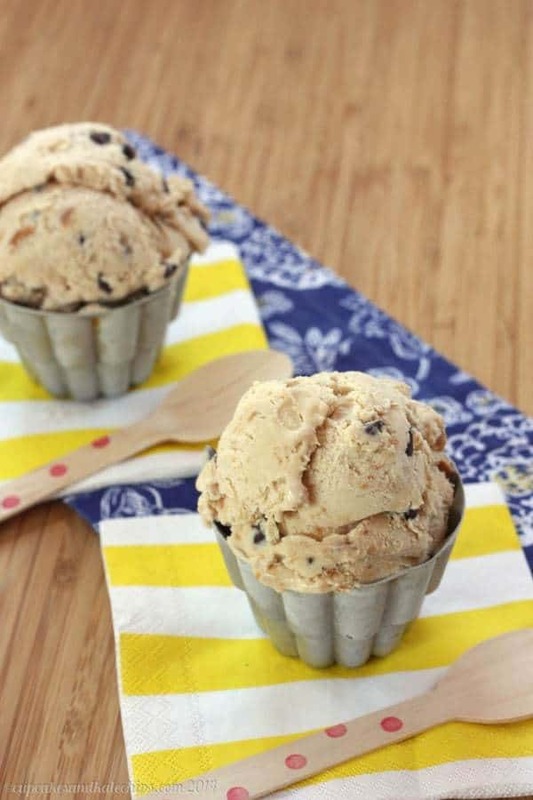 Ice cream especially for him, since it incorporated all of his favorite flavors – bananas, chocolate and peanut butter – all in his favorite dessert – ice cream. The apple doesn’t fall far from the tree. Or the drip doesn’t fall far from the cone, as the case may be. But this ice cream was perfection to us. 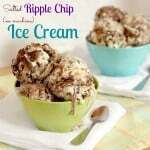 Ripples and swirls and gobs of pure, slightly salty, unadulterated peanut butter meander through a sea of sweet, lightly banana flavored ice cream, only interrupted by bits of chocolate that add just the right amount of texture to the smooth creaminess. And, you know, chocolate. I don’t know what heaven is like, but if it’s up to me, it’ll include plenty of this delightful treat. Today’s Sunday Supper event is sponsored by Davidson’s Safest Choice Eggs. You can find Davidson’s Safest Choice Eggs on Facebook, Twitter, and Pinterest, and in stores by checking out their Store Locator. And make sure you check out all of the No-Bake Summer Recipes at the bottom of this post! What is your favorite no-bake summer treat? 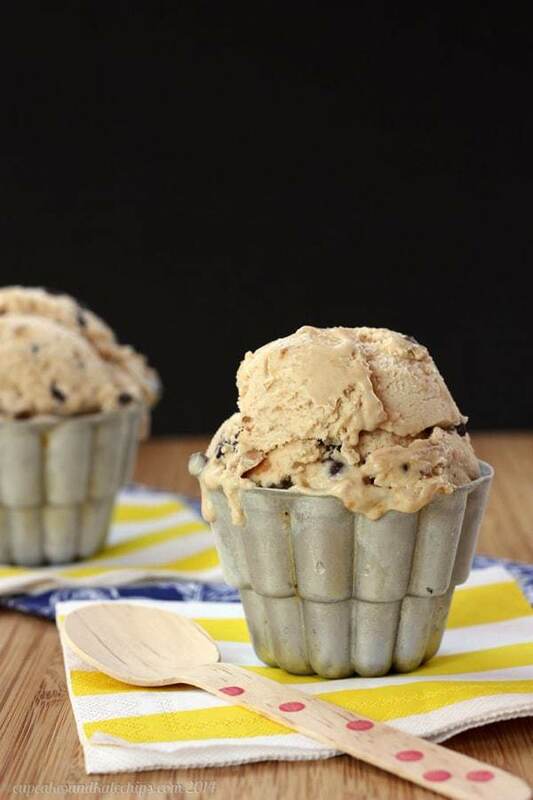 Freeze the canister or bowl for your ice cream maker. In a medium bowl, whisk together the eggs, sugar, and brown sugar until light and fluffy. Add the heavy cream, bananas, and vanilla and mix gently until thoroughly combined. Churn the ice cream according to the manufacturer's instructions for your ice cream machine. During the last few minutes, add the peanut butter in dollops, and the chocolate chips. Transfer to a freezer-safe container, and place in the freezer until firm. 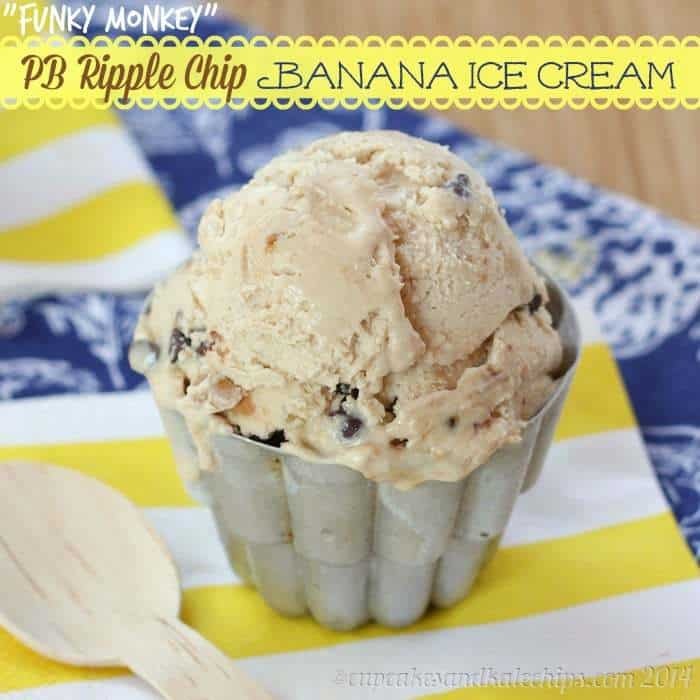 Enjoy this “Funky Monkey” PB Ripple Chip Banana Ice Cream recipe! Oh my goodness, this looks awesome and perfect for summer – well – maybe year round too! Thanks for sharing with us at Best of the Weekend – pinned to our party board! Thanks for pinning! I could eat this anytime of the year! THE BUG and I would get a long just fine if he would share this ice cream with me. YUM!! Oh you know in due time he’s going to have no desire to be in the kitchen with you and you’ll wish he was back there with his little fingers in the bowl! However I get you, I don’t like people in my workspace either. I want my fingers in bowl! lol! I think i need to hit the happy medium where he is a little older, but not to the point where he doesn’t want to cook with me. Wow! This looks and sounds incredible! Yum!! I also like to be the Lone Ranger in the kitchen. Our kitchen is relatively small and feels much smaller when my husband’s 6′-3″ frame fills the room. It’s like running into a tree at times… yeesh! Thanks Amy! Haha, your husband is like a tree, my son is like a Tasmanian Devil running all over! I totally get it-I love the idea of having my future children help me in the kitchen, in theory. But I know from experience with babysitting that my type A nature makes it verrrry difficult to cook/bake with kids! so I feel you. Hooray for David’s choice eggs making cookie dough safe! And hooooray for this gorgeous, swirly, chock full of deliciousness ice cream!!! LOVE! I know, safe raw eggs. Oh the possibilities! “The drip doesn’t fall far from the cone” <– amazing! I love that! This ice cream is balls to the wall incredible, Brianne. It's got everything that I love to eat in there. Your photos are so gorgeous and tantalizing (I wish I could lick that ice cream through my screen). And seriously, I can't wait to meet you and the rest of the gang at F&W in July! You crack me up, Nancy! I can’t wait to meet you, either! The bug has really good taste. Chocolate, banana and peanut butter…there is almost no better combination! Although, I do look back and absolutely miss those times I shared with my sweet girl, I can totally relate about having little hands in the kitchen. It’s been years, but I remember the feeling for sure. These pictures are gorgeous!! Love the metal cups and the ice cream recipe sounds deeee-lish!! Nice job! Thanks so much Marion! And I am sure when he is just a bit older, it will be much better! Can’t go wrong with funky monkey anything! This ice cream looks especially creamy and delicious. I also love your bowls/spoons. Super cute! I know, the best combination! Thanks Alida! I love pasteurized eggs and homemade ice cream. So nice that this ice cream base doesn’the have to be cooked. The pasteurized eggs does make the process much faster and easier. How lovely this looks super! 🙂 I absolutely adore banana ice cream! You know, we rarely make birthday cakes for birthdays. Our kids can pick anything they like and you never know what it might be! 🙂 This ice cream looks uber yummy!!! I think I will let him pick every year, especially if he picks ice cream! 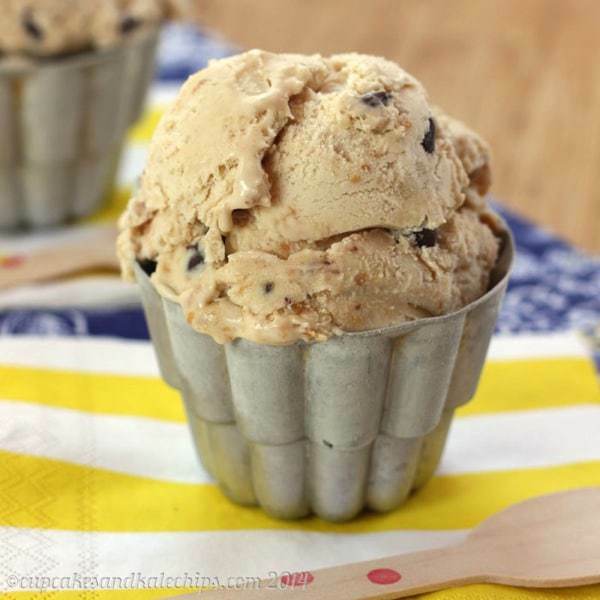 So many great flavors packed into one cool treat! This is a wonderful looking ice cream, Brianne! Seriously wonderful. And I love the metal cups – so perfect. They makes them look like ice cream cones even though it’s a dish. Really great post!! Thanks so much, Susan! My dad found those at an estate sale, and this was the first time I used them! Amazing photography and amazing pictures! You are awesome. Thanks Isabel! The amazing part was getting the photos before the little guy tried to get the ice cream! How can you go wrong with these flavors?! I love funky monkey flavored anything! This ice cream looks fantastic! Banana, chocolate and peanut butter are like three best friends! Whoa, what an amazing ice cream flavor!!! I’ll take two scoops please. No, make it three!!!! I love making homemade ice cream! Thank you for the inspiration!!! Me too! Can’t wait to see what you come up with! What a perfect summertime recipe. It worked out beautifully that The Bug did not want cake for his birthday! I agree! There is one place near me that makes amazing ice cream, but other than that, I’d prefer what I make! I really think I need a gallon of this ice cream in my house. The flavor combination is so yummy! I could totally finish off a gallon, if I had that much!! That ice cream is so appealing, I am looking for my own spoon. Wonderful! I need to make your ice cream! It looks just amazing!! 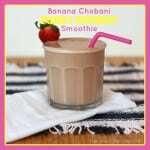 I love anything with peanut butter, banana and chocolate! Yummy! Perfect combination, isn’t it! My little guy is a smart kid! 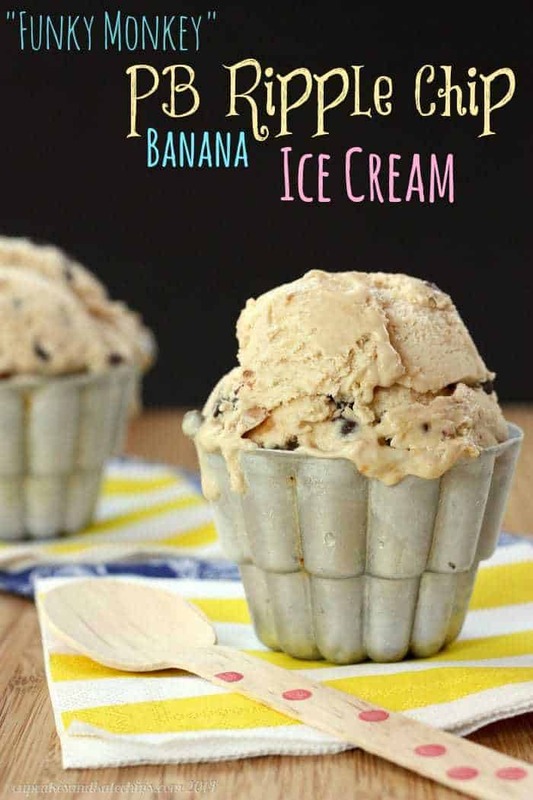 love this ice cream and love the combination of peanut butter and banana!!! Pinned and can’t wait to break out my ice cream maker! it’s coming out the first day after school ends, woot woot!! What a fun idea to celebrate the last day of school! I’d forgive my mom too if she had made ice cream like this! How yummy! This ice cream is just all kinds of awesomeness. And so are your photos. Love those cups and spoons. Thanks so much Renee. My dad is a yard sale king and found those cups!